As a contender for the 2019 Aspen Prize for Community College Excellence, San Jacinto College’s efforts around student success have gone beyond the traditional means of access, affordability and completion. Through the Pasadena, Texas-based school’s Open Educational Resources (OER) program and the “Aid like a Paycheck” program, San Jac students have saved nearly $1.5 million in textbook costs. The college also has reduced student loan default rates and increased student retention each semester. The OER program was established in 2016 through a grant from the Achieving the Dream foundation, a student success organization with a goal to assist community colleges in helping low-income students and students of color achieve academic success, personal growth and economic opportunities. 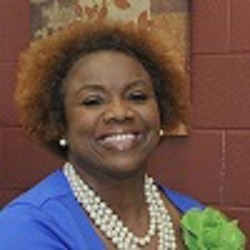 “These three things – the personal growth, the academic success and economic opportunity – are one of our visions for our students because 56 percent of our San Jac population is of Hispanic or Latino origin,” said Tonja Conerly, Open Educational Resources project director and a professor of sociology at the college. Students have access to 676 OER courses taught by 130 faculty members. To date, 15,879 students have enrolled in the open-book courses. Students are not limited to online-textbook options, however. “I know that all of our students learn differently … so if they need a hard copy, they can have it,” Conerly said. Students who want physical copies of their textbooks can coordinate purchase through San Jac’s bookstore or through an institutional partnership with Rice University called the OpenStax program. Moreover, students can print any OER textbook pages for two cents each. 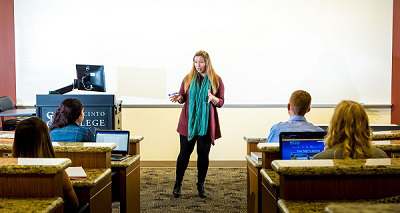 In the classroom, Conerly teaches her sociology courses using open educational resources. Her syllabus notes in bold the ways students can access uploaded textbook files or course readings on the college’s learning management system, Blackboard. Additional OER program information is available to students on the program’s website. Students can also browse OER course options when enrolling in their courses for the semester. San Jacinto College collaborated with Austin Community College, Alamo Community College and El Paso Community College as a Texas consortium to ensure that students could receive an Associate of Arts degree or Associate of Science degree in general studies without having to purchase a textbook. Program officials have been working with the University of Houston and Houston Community College around efforts to expand its open educational resources at the national and global level. The school also created an associate transfer degree in business, bringing the number of degree programs that do not require purchasing a textbook to three. Estimates by the College Board place the average cost of textbooks between $1,220 and $1,400 for the 2017-2018 academic year. Now that students have access to open educational resources at San Jac, students benefit from a reduced financial burden and “their book bag is much lighter now,” Conerly said. Similarly with distinct financial aid efforts, the college has reduced student loan default rates from 17.3 percent to 9.1 percent by offering financial literacy seminars and by offering aid in the form of a paycheck for some students. A partnership with the research organization MDRC in Fall 2014 placed 5,000 randomly selected San Jac students into two groups – half of the students received their aid payment in one lump sum (the control group), while the other half received their aid biweekly in six payments over the course of the semester. The aid project’s analysis indicated that students who were in the paycheck distribution group re-enrolled at 6 percentage points higher than those students who were in the control group, said Robert Merino, dean of financial aid services at San Jac. Students who received multiple aid payments also owed less money to the college at the end of the semester than students in the control group, Merino said. San Jac officials decided to lower the payment frequency to three monthly “paychecks” in a semester in Fall 2017, with students still receiving 50 percent of their aid up front to cover their tuition, books, supplies and other personal expenses. The “Aid like a Paycheck” program is just one of the college’s initiatives to support students’ financial literacy. Financial literacy seminars educate students on money management, monitoring their credit report, managing their financial aid and over-borrowing. Students at risk academically are required to meet with a life coach in the counseling center to address non-academic issues, and they must participate in a face-to-face financial literacy workshop or take five online modules to restore their aid for the next semester. Additionally, San Jac takes a different approach to incoming students’ financial aid packages to prevent over-borrowing. Financial literacy efforts ensure that students are making conscious and informed decisions about their aid and finances.